1. Your mother told you that breakfast is the most important meal of the day and, as you know, mothers are always right. 2. I have used my body as a human laboratory of sorts for 13 years and have discovered that a fat- and protein-rich breakfast makes a HUGE impact on my late afternoon and evening energy levels and snackiness. Yes, that is the correct term. 3. A 2005 Study in the Journal of the American College of Nutrition found that women (anywhere aged 25-60 in the study) ate considerably fewer calories later in the day and felt less hungry throughout the day when their breakfasts contained eggs, compared to those who ate the same number of breakfast calories in the form of a bagel. Now, I know getting eggs first thing in the morning is not always easy. Weekends are egg territory for most of us and on weekday mornings we tend to live in carb-land, where lovely coffee-accompanying treats like bagels, cereal, toast & peanut butter are quicker and easier when you're on-the-go. I am going to fix that! I leave the house between 6:00-6:30 a.m. most days and I neither have time nor appetite before leaving home to cook and eat eggs. 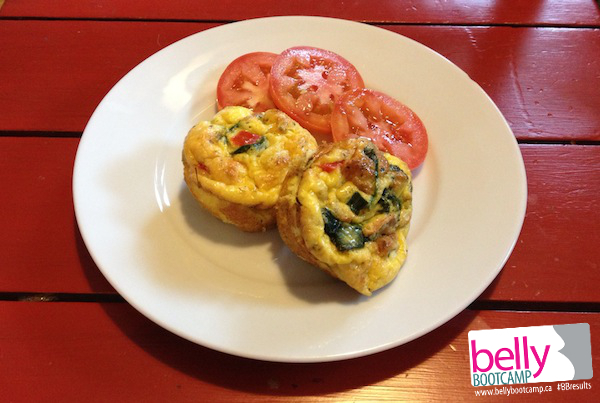 So I have included in my Sunday routine just 20 minutes to prep a batch of these delicious muffin-cup frittatas. I vary the content depending on what is in my fridge, waiting to be used up. I grab two of these with a piece of fruit and I have a fantastic, filling, whole-food breakfast that's packed with protein and gets me through to lunch, after Belly Bootcamp. When I don't have them for breakfast, I'll often reheat a couple of these frittatas with some kale, spinach or other veggies for lunch. They are also a great nighttime snack and an easy addition to your kiddo's school lunch. Enjoy! 1. Preheat oven to 375 degrees F and brush muffin cups with olive or coconut oil. Do not skip the oil as frittatas will stick otherwise. 2. Saute chopped vegetables and cool briefly. 3. Combine eggs, oil, milk, baking powder and any seasoning; beat until frothy. 4. 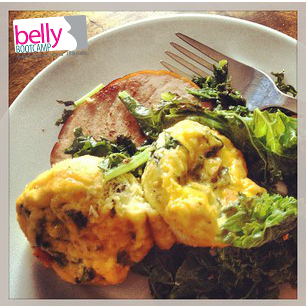 Divide meat & veggies equally among muffin cups and top with cheese. 5. Divide egg mixture among cups - cups should be about 3/4 full. 6. Bake 15-20 minutes, depending on doneness preference for eggs - in my oven, about 17-18 minutes is plenty. They will puff up and then flatten once removed. 7. Remove and cool in pan 5 minutes for easier removal, then use a butter knife to slice around each frittata and remove to baking rack to fully cool, or eat warm! The only thing better than these make-ahead frittatas is our make-ahead pancakes!